Last Christmas Dan and I gifted Roscoe a couple of BlaBla dolls (Bono Baby opened them since Roscoe wasn't here yet). We fell in love with them and I think you will too after you watch this adorable video. We like the idea of Roscoe having a little family of BlaBla dolls to play with. 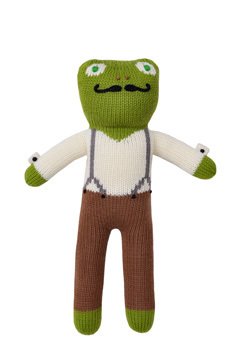 We are saving our pennies for Luigi the frog (we love his little cuff links).